Carla Howell, or Carlie to her friends and family, is a commercial agent here at DeWitt Insurance. 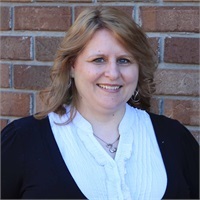 She has over 15 years experience in the industry, including prior adjusting and underwriting experience, and has been with the agency since 2013. She enjoys working with business owners in our community to protect their business so they can focus on growth. Carlie currently holds a CISR* designation after successfully completing the coursework in 2017. She is very involved with Relay for Life, as well as the women’s ministry and production arts at church.